This is a ticketed signing event. Get tickets here! Meet Crusoe the Celebrity Wiener Dog (and his faithful human) as they celebrate their new book, CRUSOE, THE WORLDLY WIENER DOG: Further Adventures with the Celebrity Dachshund. Join the photogenic Crusoe as he leaves fame and fortune behind to expand his horizons, get his passport stamped, and journey across the globe to eat delicious food, relax on beautiful beaches, dig lots of holes, and generally enjoy all that celebrity travel has to offer. Ryan Beauchesne is the proud owner, father, manager, and chief pooper-scooper of Crusoe the Celebrity Dachshund. The last few years of Ryan’s life have been entirely devoted to Crusoe and his antics. 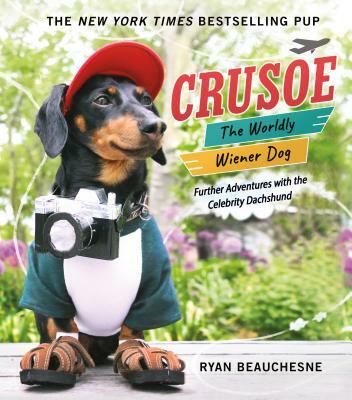 With multiple viral videos, travels across the world, a New York Times bestselling book, and over 3.5 million followers on social media, Crusoe has become the unofficial ambassadog for dachshunds everywhere, and for any dog with a passion for whimsy and adventure.